The 19th century Bengali great poet and dramatist Michael Madhusudan Datta correlated rivers with mother (poem- Kopotakhha Nod). Our national poet Kazi Nazrul Islam most often termed rivers as his 'Beloved' (poem-Karnaphuli). The union of rivers with rivers and the union of rivers with seas is a cosmic matter. The union of human being with rivers is also celestial. Many poets across the globe have composed innumerable poems, songs and written novels on the rivers and their roles in the lives of people. River and water bodies are indispensible elements for humankind. From time-immemorial, rivers and water-bodies have been the lifeline of human civilisation in thousands of ways. History reveals that all the landmark civilisations grew up at the banks of rivers. The very civilisation of the Bengal was also built on the bank of the rivers Ganges-Brahmaputra and Meghna. The culture, rituals, religious beliefs and wisdom of people are almost evolving around rivers and riverine lifestyles and those are reflected in our arts, artifacts, utensils and handicrafts. Rivers in our country is one of the most popular attractions for the tourists. Journey by boat is very much enjoyable and an adventurous travel to a significant percentage of people. The major tourism activities in the country are also taking place based on river and water bodies like haors, baors, seas, rivers, beaches, coasts, mangrove forests and many more. By relaxing on riverbanks, one can easily keep away his/her from the hustle and bustle of city life and anxieties for a while. The most important features of the wetlands and dazzling river systems of the country are the Sundarbans, the great mangrove forest where the Ganges and Brahmaputra flow down into the Bay of Bengal. According to the present global phenomenon of the tourism industry, rivers and waterbodies are being focused for sustainable development of a country. People in this subcontinent are closely interlinked with rivers and wetlands. The aesthetic and recreational values of rivers' beauty and bounty are historically recognised by the travelers of ancient time like Ibne Battuta, Hiuen Tsang. The ancient civilisation of Bengal grew up along the riverbanks over thousand years. The rivers of Bangladesh mark both the physical characteristic of the nation and the lifestyle of the people. These rivers, about 700 in number, generally flow to south. The larger rivers have been serving as the main sources of water for centuries, and as the principal arteries of commercial transportation as well as major tourism facilitators. 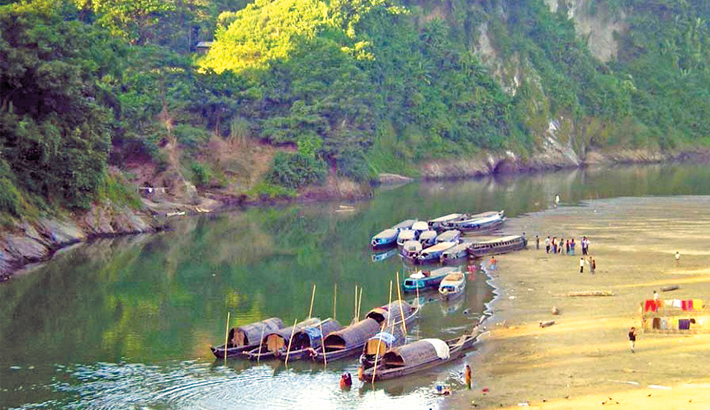 Rivers of Bangladesh have nurtured this region, with its ancient civilisations and rich culture. These mighty waterways offer wonderful opportunities to explore the variety and beauty of the Bangladeshi landscape and the livelihoods they support. Hence, Bangladesh is called the land of rivers or the gift of rivers. The outflow of water from Bangladesh is the third highest in the world, next only to those of the Amazon and the Congo systems. Major rivers of the country include the Padma, Meghna, Jamuna, Brahmaputra and Karnaphuli. Earlier for tourism development purpose, river and water bodies were not much included in conservation, preservation and maintenance activities of the government. However, with the passage of time rivers are being significantly focused in the country for tourism development. Despite the ecological and cultural significance of the rivers and wetlands, we are not providing proper attention to save and mange our rivers and their resources in a sustainable way. Rather we are polluting and encroaching on the rivers to an increasingly greater extent. The government has already formulated policies and strategies on management of water resources and the tourism sector and the relevant ministries and departments are seriously looking into managing the rivers of the country sustainability. Rivers deserve involvement of mass people and their cooperation in maintaining the ecological balance and in developing nature-friendly river tourism based on them. Tourists are sure to enjoy the riverine beauty of Bangladesh, smooth plying of various types of boats with the rhythm of waves and the spectacular beauty of sunset when the sky and river meets at a point to represent a heavenly soothing nature. We need to take a long-term vision and formulate effective goals targeting river tourism as an important and priority programme. Let us utilise the public-private ties for ensuring sustainable river management for an healthy tourism sector and sound environment. The Writer is Manager (PR & SP), BPC.